At Near East University, we understand that student life is an integral part of a university education. NEU aims to provide a high level of academic excellence combined with the opportunity for students to improve their social interaction skills, further their personal development and to expand their cultural awareness in an environment that celebrates diversity. What does NEU Ideas do? NEU Ideas’ goal is to represent all International Students at NEU by celebrating the diverse background of the student population. Throughout the academic year we organize social events such as student orientation, National Days, cultural days and sporting activities. 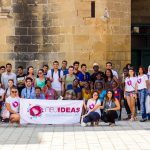 NEU Ideas will also officially recognize and provide support to Clubs and Associations that represent International Students. We want to officially welcome you to our university and to introduce you to all that it has to offer, NEU Ideas has organised a special Orientation Event at the beginning of the semester. We will provide a campus tour to all of our International Students, along with general information about university life, how to access the online student system, how to get a bank account etc. At the end of Orientation we will also arrange a Welcome Event so you can meet the members of our team and also your fellow students. This will be a great opportunity to make new friends, find out about our Clubs/Associations and for us to make you feel at home at NEU!